We currently have one position open. Click on the title of the job below to see more information about each one. If you are interested, apply in person at our office: 219 Street Road, West Grove PA 19390. Local and state government officials, along with members of the community gathered on Thursday June 7, 2018 to commemorate the 50th anniversary of the founding of the Southeastern Chester County Refuse Authority (SECCRA). 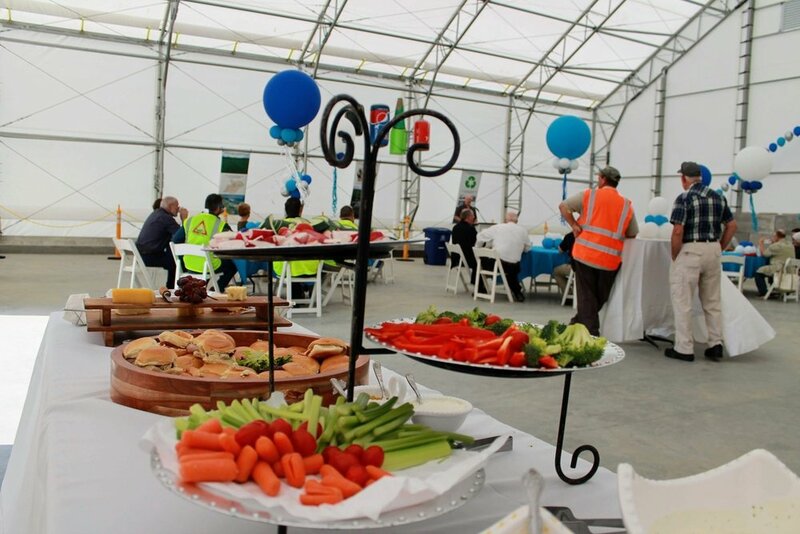 The event was held inside a brand-new facility designed to handle recyclables for the 110,000 residents of the 24 municipalities in SECCRA’s service area. Funding for this facility was partially provided by a $250,000 grant from the Pennsylvania Department of Environmental Protection. “SECCRA has a long history of environmental stewardship, going back to its genesis in 1968 led by Anson B. Nixon”, said Bill Stullken, former general manager who retired from SECCRA in 2013. He added, “Since the environmental awakening of the mid-1960’s forward thinkers and doers in southern Chester County have taken the initiative to safely manage their solid waste. The commitment continues. SECCRA is pledged to planning and implementing safe, effective solid waste management now and in the future. Scott Mengle, SECCRA’s current general manager told the crowd why the new facility was needed. Recycling in southern Chester County had grown over 750% over the past nine years with the advent of single-stream recycling. SECCRA’s existing infrastructure was simply not big enough to handle these volumes. He said, “The primary purpose of this building is not to do the separation of recyclables here, but to allow smaller loads to be consolidated into larger, more cost-effective ones. Once consolidated, those loads go to SECCRA’s partners who separate the recycling into its individual constituencies.” What used to be an operation that would fills 3 tractor trailers of recycling a week has grown to one that fills 4-5 per day. 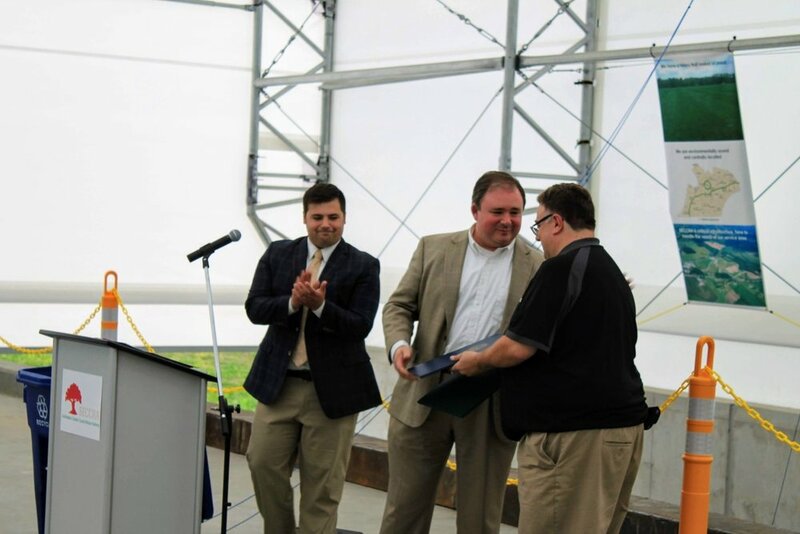 Instead of holding a traditional ribbon cutting ceremony, SECCRA wanted to figure out a way to do something recycling related that would have a similar effect to cutting a ribbon. 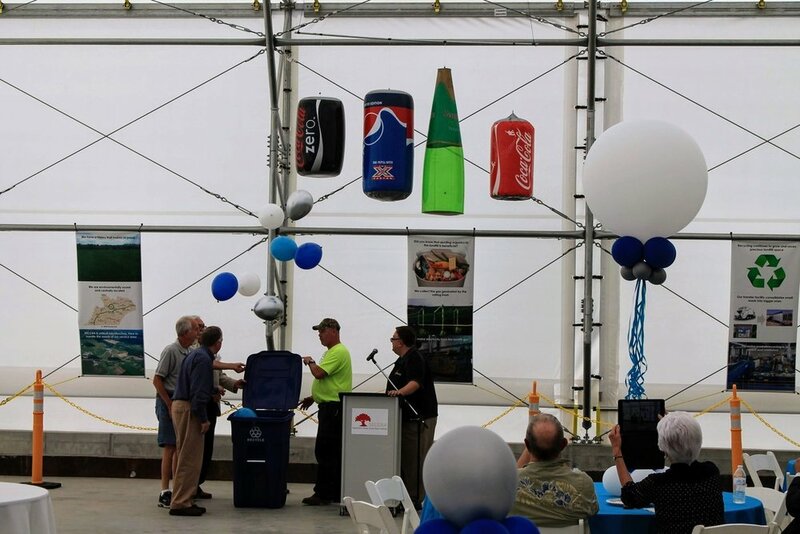 As such, members of SECCRA’s board of directors opened the lid on a household recycling container, which triggered giant inflatable replicas of recyclables to fall from the ceiling in to a recycling transfer trailer below. The following are the locations and information about the household hazardous waste dropoff events in 2018. Saturday, Sept 8, 2018 Oxford School District Administrative BLDG. We are constructing a new building to handle our single-stream recycling. The work consists of supplying and installing concrete and rebar, for slab on grade, footers and walls, fine grading and backfill of installed concrete walls, for a recycling processing building owned by the SECCRA, as indicated in the Bid Specification, at the SECCRA Community Landfill. Click here for the bid package. Two original copies of the bid must be submitted to the SECCRA Office on or before 2:00 o'clock PM prevailing time August 15, 2017. The bids must be sealed and the envelope must be labeled with the words "SEALED BID: CONCRETE WORK FOR IPC". Bid will be publicly opened at 2:00 o’clock PM prevailing time August 15, 2017, at the SECCRA Offices. Bids will be awarded at a special meeting of the Board of Directors’ meeting, expected to be on or about, August 15, 2017. A prebid meeting was held on August 2, 2017. Click here for the sign-in list. Addendum No. 1 has been issued. Click here to access. The Board of Directors will meet on August 16, 2017 at 4:00 pm to vote on acceptance of the lowest responsible bid. The E. Kneale Dockstader Foundation, a charitable public foundation formed in honor of E. Kneale Dockstader, announces its 2017 grant funding round. Applications are due on April 3, 2017 for southern Chester County projects that enhance the natural environment, and environmental (scientific/engineering) scholarships. The Foundation’s mission is to make connections with and build understanding of our environment, encourage programs that enhance our natural environment, and reclaim a common sense of our environment in southern Chester County. Project applicants will describe not only what they propose to do, but how they will involve others in the community who will be a part of a truly successful problem solving enhancement to the environment. Competitive grant applications will address underlying issues and not merely treat symptoms. Scholarship applicants must demonstrate their intentions and commitment to further their environmental education with the goal of implementing that education for the benefit of the environment. Ties to the region are an important factor in scholarship evaluation. If you know of other persons or organizations who might be interested in filing an application with us, please pass this invitation along. This invitation may be copied, faxed, or reproduced electronically. We wish to reach the widest possible audience. The Foundation has adopted guidelines for the preparation of applications. These may be used by prospective applicants to determine whether their projects fit with the Foundation’s mission. You can get a copy of the guidelines and/or application information by clicking here. If you need more information, please contact Bill Stullken, Foundation Secretary: Phone 484-748-0050, Email: dockstader@seccra.org. The Board of Directors of the E. Kneale Dockstader Foundation are proud to announce the following grant recipients for 2016. Thank you to all who have applied, and congratulations to those who received grants! Recipients will be officially notified by mail. Hillendale PTO, Hillendale Trail: $30,000. The Land Conservancy of Southern Chester County, Nature Preserve and Center: $15,000. Brandywine Red Clay Alliance, Education Infrastructure and Trout: $10,000. Brandywine Conservancy, Stormwater Infrastructure Demonstration Project: $20,000. Kennett Area Park and Recreation Board, Renovations to Herb Pennock Park: $8,700. YMCA/Avondale-West Grove Rotary, Community Garden: $3,600. Kennett Area Park Authority, Control of Phragmites: $2,000. Dr. Barbara Stewart, Pollinator Garden for New Bolton Center: $800. Oxford Area Recreation Authority, Landscaping and trail repair: $5,000. Oxford Area School District, Scholarship $4,000. Avon-Grove School District, Scholarship $4,000. Kennett Consolidated School District, Scholarship $4,000. Unionville Chadds Ford School District, Scholarship $4,000. The E. Kneale Dockstader Foundation, a charitable public foundation formed in honor of E. Kneale Dockstader, announces its 2017 grant funding round. The E. Kneale Dockstader Foundation, a charitable public foundation formed in honor of E. Kneale Dockstader, announces its 2016 grant funding round. Applications are due on April 1, 2016 for southern Chester County projects that enhance the natural environment, and environmental (scientific/engineering) scholarships. The Foundation has adopted guidelines for the preparation of applications. These may be used by prospective applicants to determine whether their projects fit with the Foundation’s mission. You can get a copy of the guidelines and/or application information here. From time to time we utilize rental heavy equipment, both with and without an operator. Click here for a copy of the bid documents. Because of changes in market conditions, SECCRA is now able to accept your electronics for recycling at no charge. We are extending this to all residents in our service area. However, this does not include groups or companies, so fees may still apply to those entities. We are accepting them during our normal business hours at our landfill at 219 Street Road, West Grove PA. Click here for general information about electronics recycling. Click here to download the presentation that we have been giving to local groups to help in their FLL Trash Trek projects. What's going on along Route 926? This is a concise summary of what's going on written by a local blogger. Click here for the post. There are no more dates in 2015. When the 2016 dates are announced, we will post them here.